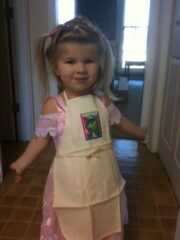 Katie Beth in her apron that just came in the mail. She loved it. We got out her toddler cookbook and made multicolored meringues. She had a blast, but I could not get her to use less force. Meringue went everywhere and she kept eating the power sugar that had fallen on the floor and table. But, they tastes very good.